Raise your hand if you’ve ever banished something to your basement, with a well-intentioned plan to deal with it next time you have a moment to spare. 10 years later, your basement is overflowing with clutter, your couch is buried, and you’re stuck dodging precarious mountains of memorabilia every time you blow a fuse. Talk about “out of sight, out of mind”. 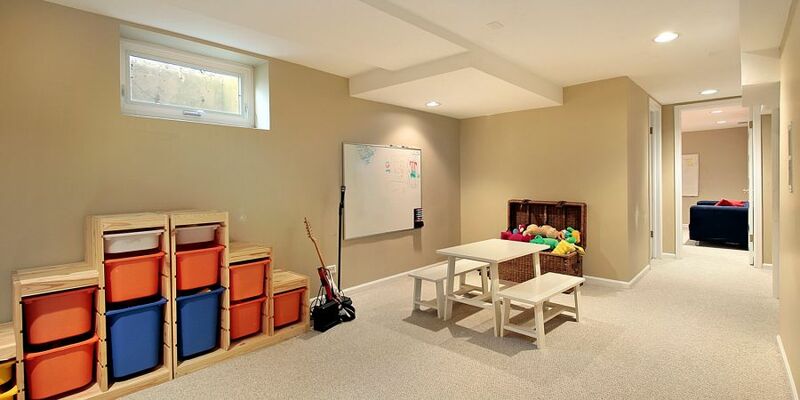 Basements often pull double duty, functioning as both a living space and a storage space. If you have a small basement or your basement has become a black hole for all your keepsakes and difficult-to-store items, don’t despair. Finding the right balance between both functions can be challenging, but with a bit of organizational elbow grease, your basement can effectively serve both purposes - and look great in the process. Here’s how. When you’re organizing any space, especially your basement, getting control of the clutter is always your first step. If your basement has become the dumping ground for all the things you don’t know what to do with, this process can seem especially daunting. The best thing to do is just roll up your sleeves and dig in. Keep: Hang on to items that you actually use. Donate: Lower-value items that are still in good condition but that you no longer use, such as old toys or books, can be donated to your local Goodwill. Sell: Higher-value items that are in working condition can be sold online or in a garage sale. Toss: Get rid of anything damaged or that no longer works, especially if you don’t have immediate plans to repair it. Once you’ve sorted through all your clutter, organize the items you plan to keep into piles by category, such as books or holiday decorations. Categorizing your items will help you determine whether you need to purchase additional storage materials, and what types of materials you might need. Help me declutter my basement. Utilities: The utility zone will house your water heater, furnace, and any other utilities and equipment. Make sure these areas stay clear and are easily accessible at all times in case you need to get to them quickly or in an emergency such as a power outage. ORGANIZATION TIP: Store a flashlight on top of your fuse box so you don’t have to search for one in the dark if the power goes out. Storage: The items we store in our basements are often bulky or oddly shaped, which can make creating a storage strategy difficult. Whether you use your entire basement or a small section of it for storage, try separating this zone into additional zones based on what you’re storing; for example, you could have a zone for holiday decor, a zone for sports equipment, and a zone for keepsakes. Living area: Try to reserve your living area for living, not storage, so the space is easier to relax and unwind in. If you need extra storage, use cubbies to keep the clutter tucked away. Whether you create customized built-in storage units, mount shelves, or purchase modular freestanding shelf units, every nook and cranny in your basement can be used for storage, including the space under your stairs and up near ceilings. It’s always a good idea to store the items you keep in your basement on shelves off the floor to help prevent damage, especially if your basement is prone to dampness or seasonal flooding. Metal shelving will withstand heat, humidity, and moisture better than wood shelves. 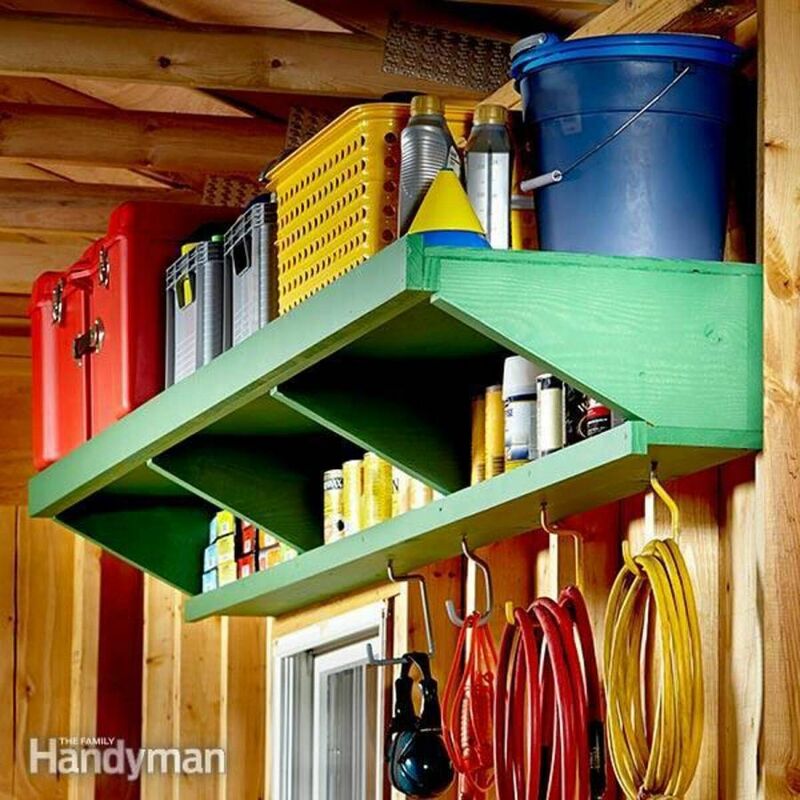 You can make even more use of your shelves by attaching hooks to the bottom like the Family Handyman. Just be careful not to overload them with more weight than they can handle. "These double-decker shelves can be used to store paint, cleaning supplies and you can add hooks to hang items such as extension cords and brooms. This simple woodworking project will cost you between $20 and $100, depending on what materials you already have on hand." ORGANIZATION TIP: Don’t store heavy or bulky items on the top shelf—they can be dangerous to move. Moisture can be a real problem in basements, as can flooding. Storing your belongings in plastic containers will help protect them from damage, especially books and old photos. Plastic containers are also easier to stack and move around than cardboard boxes. ORGANIZATION TIP: Use clear plastic bins so you can see what’s inside, or label your bins so you don’t have to dig around to find what you’re looking for. Sorting all of your belongings into categories after you declutter, even if that category is “miscellaneous”, makes it easier to find a home for each item. This also makes it easier to put new items where they belong as soon as they make their way into your basement storage zone. Items and containers you access more frequently should be easier to reach. Keep these containers on shelves that are eye-level or lower, and don’t bury them behind other things. Aspen at @cleanandcollected stored her stroller and outdoor-friendly chairs and table near her garage door, close to where they will be needed most. 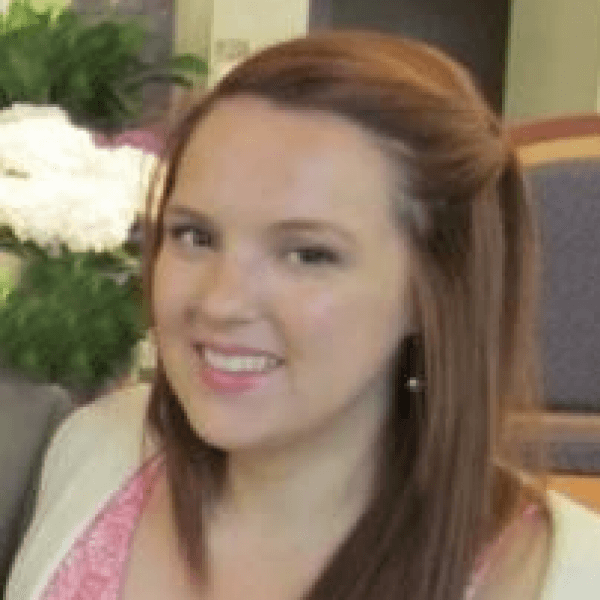 Everything else in her garage (which is basically an above-ground basement, amiright?) is neatly stored on metal shelving where it will be easiest to access. Don’t stack containers too high. They’ll be harder to access, and without additional support, they may fall over and cause damage or injury. If you need to stack things higher, invest in sturdy storage organizers or shelves so you won’t have to move the containers on the top of the stack to reach the ones on the bottom. Stacking containers too deep also makes it difficult to access those relegated to the back row. [...] since Dear Husband gets a new Rolling Stone each month, it made sense to put the storage of those magazines near the stairs, so that he’s more likely to just run down the stairs and put the latest issue in the bin. When you’re decluttering and sorting through your belongings, Sharon from Mom of 6 recommends that you touch every item. This helps you account for all your clutter, and ensures that you make intentional choices about what to do with each item without procrastinating. In order to stay focused I would start in one “section” and work my way from the left to the right, touching every single item, every box, and every bin. Nothing was left until “later”. Every item was dealt with as I came to it. If you have an unfinished ceiling, try mounting wire shelves and using the pockets between beams to store light, bulky items like your Christmas tree, or low-profile plastic containers filled with lighter items. Add shelves between studs for smaller items like spray paint. If your basement is the only place where you can store these items, make sure you use waterproof plastic containers and take appropriate precautions to prevent mold and mildew from developing. Tackling the mountain of clutter that’s built up in your basement can be daunting, but it’ll be worth the effort when you can actually use the space and you don’t have to navigate a sea of stuff you no longer use.